← The Bible in five statements. 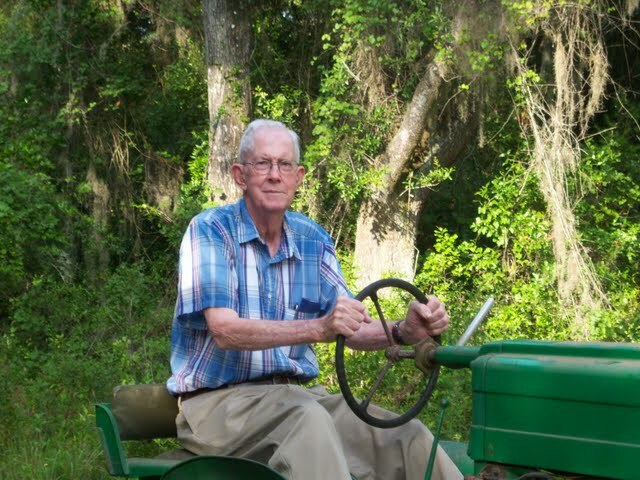 Robert Henry Hargrave, 83, of Gainesville, Florida passed away in his home early Sunday morning Dec. 6th, 2009. Robert Henry was born in Gainesville to Robert T. and Effie Hargrave on Jan. 27th, 1926. He joined the US Army after high school and served with the 18th Mechanized Cavalry in Europe during WWII. He was among the soldiers guarding the bridge at Remagan where the Allies first crossed the Rhine on the push to Berlin. After demobilization, Mr. Hargrave, like so many others of the “greatest generation”, went to college on the GI bill, married, got a job, raised a family and helped build the country. As a third generation Gator he earned Bachelors and Masters Degrees in Agriculture from the University of Florida. Robert taught vocational agriculture in Orange County for 10 years before moving back to Alachua County where he taught at Buchholz Jr. High, Howard Bishop Middle School and Mebane Middle School. He served as President of the Alachua County Classroom Teachers Association in 1964-65. Mr. Hargrave retired from teaching in 1978. After retiring Robert helped develop and test wood gasification units. He successfully converted both a pickup truck and tractor to run on wood. He also devoted time to gardening, raising cattle and his grandchildren. He was a long time member of Antioch Baptist Church and served there as a deacon, a Sunday School teacher and sang in the choir. Mr. Hargrave was preceded in death by his brother, John Rolfs Hargrave, and is survived by his wife of 61 years, Ruth F. Hargrave; children Bob (Ellen) Hargrave, Beth (Mark) Benedict, June (Bob) Hartley, Ruth Ann (Randy) Williams; sisters Effie Kirby and Lucy Hudson Thomas; nine grandchildren and two great-grandchildren. The family will receive friends at the funeral home on Thursday from 4:00 – 6:00PM. Funeral Services will be Friday, December 11, 2009 at 11:00AM at the Antioch Baptist Church 3612 NW 177th Ave. Gainesville, FL 32609. Interment will follow at Antioch Cemetery. For those who wish, memorial contributions may be made to the “Library” or the “Lottie Moon Christmas Offering” both C/O his church. MILAM FUNERAL AND CREMATION SERVICES, 311 S. Main St. Gainesville, FL. 32601 (352) 376-5361. Grandaddy Hargrave’s life could fill several books. I’d like to write those books. But today, I don’t have more to say than this: he died at home on the farm where he’d grown up, early in the morning of St. Nicholas day with his firstborn son at his side. Grandaddy is the patriarch of a sprawling Southern family, and well loved by his neighbors. He taught me what it means to live a holy life. And he died peacefully, surrounded by his wife, children, grandchildren, and great-grandchildren, without shame and with little suffering.